An exclusive exhibition for the wiring harness & cable assembly shops, cord set manufacturers, and companies that process electric wire & cable. Find the equipment, instruments, tools, materials and and supplies used in wire & cable harness assembly. 28th International Metallurgical and Materials Conference is a traditional meeting of metallurgists, material engineers, managers and other participants. The global leading Guangzhou international spring industry exhibition will be held in 2019 June 13-15 at China Import and Export Fair Pazhou Complex successfully. 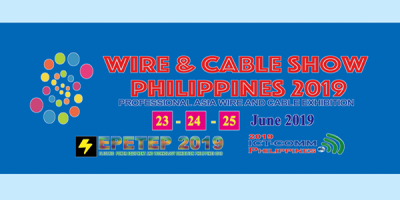 AMI's ​Polymers in Cables 2019 will take place June 18-19 at the Sofitel Philadelphia in Philadelphia, PA.
You are Invited to Wire & Cable Show Philippines 2019 is scheduled to be held from 23-25 June 2019 at SMX, Manila City, Philippines. Jicable'19 is an international forum for the exchange of information in the fields of research, industrial development, installation, operation and diagnoses relating to insulated power cables and their accessories.